In all of North America there is no more perfect intersection of climate, culture, and colourful history than San Francisco - the culmination of Manifest Destiny, the Golden Gate to the Pacific Ocean, and the treasured house of the wealth of the great California Gold Rush. Purged of her wild, anarchic past by a devastating earthquake and fire at the beginning of the twentieth century, San Francisco has emerged as the most cosmopolitan city on the West Coast. San Fransisco is deceptively ancient; its history shrouded in a fog of false domesticity. The Bay Area has known many masters, each leaving a distinctive mark upon the land. As San Francisco blossoms it attracts fungitives and practitioners of unorthodox faiths from across the world. Tales of the region assume mythic proportions as it becomes the most ethnically diverse, and most lawless, place in America. 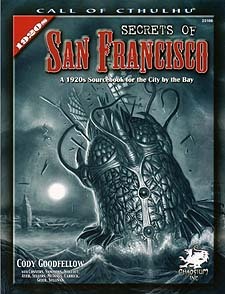 Secrets of San Francisco provides excellent background for a Call of Cthulhu campaign set in the Bay Area of the 1920s. It includes urban geography, civic history and research venues, and mythos lore. Many period photographs are provided and dozens of historical figures are introduced, including several who collaborated and corresponded with Lovecraft. Here are provided descriptions of where San Franciscan's are sent when they break the law, go insane, or pass-beyond. Here are the sights, sounds, and secrets of this place that makes it a unique city.